At 4pm on Thursday 9th of August 2018, I performed at The Charterhouse in London for the funeral service of Nicolas Christopher Henry Browne-Wilkinson (b. 30th March 1930- d.25th July 2018). Julian Perkins played preliminary music on the organ by Bach and Handel, before the Introit ‘Psalm 23’ by Charles Hylton Stewart was sung by the choir. The choir consisted of Augusta Hebbert (soprano), Tom Scott-Cowell (countertenor), Adam Tunnicliffe (tenor) and Andrews Davies (bass). After opening sentences from the Rev Robin Isherwood, the Hymn ‘Dear Lord and Father of Mankind’ by Hubert Parry was sung. After a reading, by Oliver Browne-Wilkinson, of ‘The Irish Prayer’ there was an informative and heartfelt address given by Martin Marriott, a life-long friend of Nico Browne-Wilkinson. ‘Eternal Source of Light Divine’ from Handel’s Ode for the Birthday of Queen Anne was next in the service, with playing from Russell Gilmour (natural trumpet), singing from Tom Scott-Cowell (countertenor) and with Julian Perkins on the A=440Hz church organ. Tom sang from downstairs and Russell and Julian played from the organ loft, giving atmospheric acoustical space between the singer and instrumentalists. It was a great honour to play this spine-tingling movement, one of Handel’s finest. Simon Browne-Wilkinson continued with an Address before the next hymn, ‘O God, our help in ages past’. Julian Perkins had arranged for me to play a descant over the last verse, which worked well on the B-flat trumpet. After an Address by Ngaio Anya, the choir sang Bach’s ‘Jesu mine Freude’ (BWV 227). After Prayers, the Hymn ‘Guide me, O thou great Redeemer’ was sung, and another trumpet descant was played on the finale verse. After the Committal and Blessing, the choir sang the ‘Kyrie’ from the Petite Messe Solennelle by Rossini, accompanied by Julian Perkins on the 1842 organ. The Charterhouse, in Smithfield, Clarkenwell in the London Borough of Islington, has had a long and varied history. 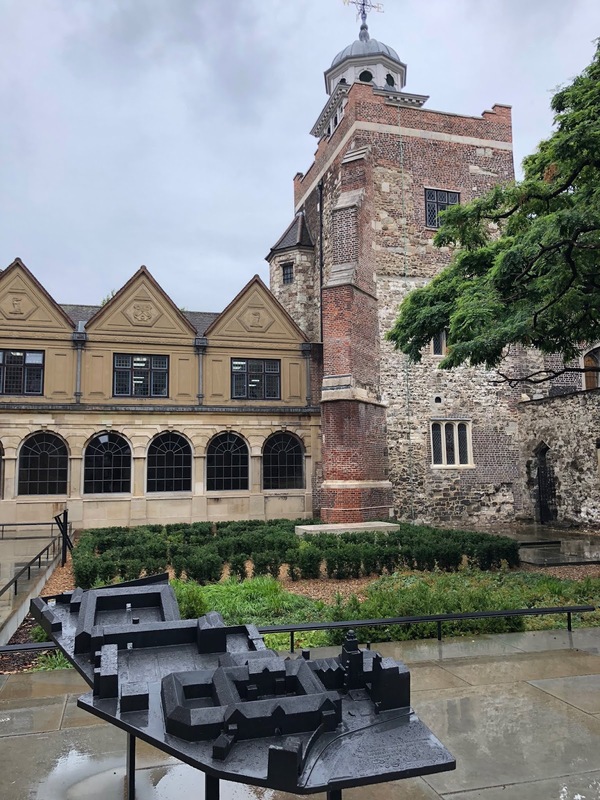 Originally London’s largest cemetery for victims of the 1348-9 Black Death, the Charterhouse later became Carthusian monastery and then a grand mansion providing Royal refuge. It was at this point, after the dissolution of the priory, that members of the celebrated Bassano family of instrument makers were tenants of the former monks' cells. 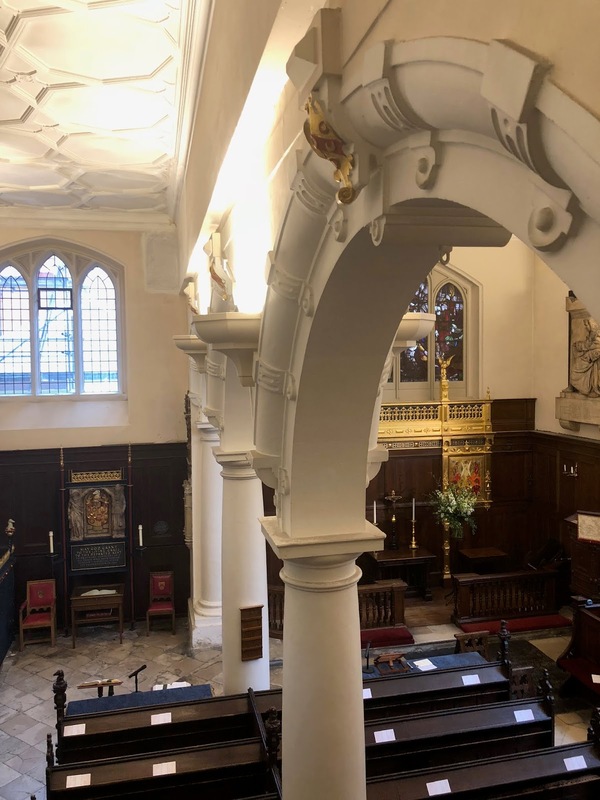 “Elizabeth I met the Privy Council here before her coronation in 1558 and James I used the Great Chamber to create 130 new Barons before he was crowned. But it was in 1611 that Thomas Sutton bought the Charterhouse and established the foundation that now bears his name.